A week ago Saturday, I went to a new priest for confession. The priest turned out to be an Irish curmudgeon. 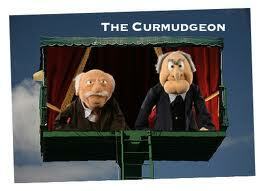 Do you know what a curmudgeon is? The dictionary says a curmudgeon is a bad tempered or a surly person. But, when you put the two words ‘Irish curmudgeon’ together – the meaning can be a bit different. Well, this turned out to be a rather thorough confession. Fr. Curmudgeon gave me a thorough going over. But towards the end he said, “I don’t mean to be hard on you. I just want you to know I’m concerned for your soul…” He said it warmly, tenderly and with a smile… I’m most sure there was love underneath. When a reporter asked Pope Francis to describe himself, he said, “I’m a sinner.” Imagine. A pope who admits to sin, and who routinely goes to confession. The pope preached a homily the other day about Confession. He said ‘some people (who make excuses) say I confess directly to God, but that’s like confessing by email. No eye contact. No person to person accountability.’ Quoting St. James, Francis said we confess sin one to another. Sadly, a great number of Catholics have gotten away from regular confession. Worse, some are infrequent in attending Mass. St. Paul tells Timothy and us in Scripture that we’ve got to persevere in the faith. Growing in the faith is NOT slacking off… or being stagnant in our faith walk. Paul talked about ‘winning the race.’ Winning the race means cooperating with God’s grace of faith and encouraging its growth… all of our lives. I preached recently — the weekend of the 30th Sunday in Ordinary Time. That’s when St. Paul talked about this faith business as if it’s a race. He was near the end of his life and he was ready to claim the prize of staying in the race. He was no bench-warmer. During the homily at our parish, I asked the attendees at Mass: WHY DID YOU COME HERE TODAY? In my own response I said, “If growing your faith isn’t one of the reasons… I’d ask you to think about this.” And for the rest of the homily, we went through what are called the Five ‘W’s of growing in our Faith. WANTING — Do you say you want to have a better faith? Wasn’t it a week or two ago that the apostles asked our Lord, “Increase our Faith?” Jesus told them they will be able to do more… accomplish more… even some of the same powerful things that Jesus did… and they knew how early in their faith walk they were. They asked for more faith. St. Paul is telling us that if you think you want more faith… you’ve got to act like it… pray for it… spend more time on it… do things that bring about holiness… it might start with a good confession… done regularly. For others, it’ll mean coming off the bench and becoming active in service … or maybe committing to attend a daily Mass once a week… You say you WANT more faith? You say you WANT deeper faith? Pray to him: LORD, INCREASE MY FAITH. Here’s the 2nd W: WAITING. Now our parish is a pretty much older… a senior oriented parish in Arizona. In fact, I told them that it’s referred to as ‘God’s Waiting Room.’ But we have to Wait on the Lord… Wait until His time to begin to infuse and grow new faith in us. It may start by meeting a powerful convert. It may mean meeting a priest who will touch our hearts. Sadly, it could be the death of someone which begins the process of a new growth in faith. How long? In God’s time we’ll know the answer. WITHSTANDING … If faith begins to grow in you — you’ll begin to sense it. But so will others. St Paul tells Timothy that he had to bear his share of hardships for the Gospel… He was beaten… Paul said ‘everyone deserted me.’ That’s what St. Paul had to WITHSTAND. If, after wanting and waiting, greater faith begins to kick in, our life begins to change… and maybe… just maybe your family and friends will suggest you’re acting kind of different. Here you are beginning to talk about the Lord working in your life… Some people may even begin to think you have gone off the deep end. And what you and I need to do is to pray: God give us strength… let me not be ashamed of WITHSTANDING changes that God is going to start sharing within me. Just like he shared with Jesus and the Apostles. The next W is what? WORKING. Jesus said we need to work… In fact Jesus spoke bluntly. As we heard a couple weeks ago, we should do these things because it is expected of a disciple. I told the people at our Tuesday Bible study this fact: In our country, there are many millions of people who claim to be Catholic and a study says only about one third of them go to Church. If you think your pastor or your bishop is responsible or even able to reach the 2/3 of your family and friends who have stopped going to church, you’re fooling yourself. You and I… you and I are responsible for going out to lovingly invite the two thirds. Don’t wait for the priest. He’s running a parish and its programs. You and I need to get out and find the lost sheep… Can I get an Amen on that? Let’s get WORKING using the gifts that God has given to us… because when it comes to eternity — you don’t want to dig up the one God-given talent that you buried in your yard. Bring the multiplied talents that sprang from God’s gift to you. And finally…. WINNING — Our music theme on the Catholic Vitamins podcast is from a Gospel singer. The words tell us, in part, we’ve already won. But that means at the very end when King Jesus returns – he and his followers will have won. But if you live in today’s world – you know there are a lot of battles to be won. A lot of them. You and I… most of us want to be on the WINNING TEAM. For those who WANT it… those who WAIT for it… for those who WITHSTAND the pressures of non-believers… Those of us willing to WORK for it… The Lord is leading us… through the cross… through the power of His precious blood… we are being led to WIN in His glory. I feel like singing, “Mine eyes have seen the glory…” We can WIN brothers and sisters… Can I get another AMEN?